GAINESVILLE, Fla. — Schooool’s out . . . for . . . the summer, as the kitschy Alice Cooper rock anthem informs, but some teachers and administrators from school districts around the state will stay sharp and learn new instructional leadership practices for the fall by attending an intensive professional development program June 13-16 at the University of Florida. The UF Lastinger Center for Learning Summer Summit will engage educators in a four-day professional learning experience, equipping them with tools and skills they can use to transform classrooms, schools and districts. The Summit, led by UF College of Education faculty instructors and center staff, kicks off on with a one-day conference at UF’s Emerson Alumni Hall, featuring keynote speakers Alberto Carvalho, superintendent of Miami-Dade Public Schools, and Joellen Killion, senior adviser for Learning Forward, which is a blue-ribbon coalition of American education advocates and thought leaders. Participants then can choose to attend one of four different institutes offered over the following three days. The topic choices are: instructional coaching, school leadership, leading for equity, or facilitating effective collaboration. Lastinger Center Assistant Director Phil Poekert said the conference and institutes will personalize and deepen participants’ learning around instructional leadership and other areas considered crucial to transforming today’s unsettled education system. 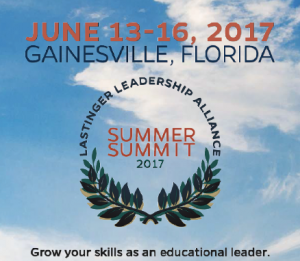 For registration and other information, visit the Lastinger Center Summer Summit website at http://lastingercenter.com/summersummit/. Registration closes on June 8.